A small plane heading for Georgia spiraled out of control and crashed Tuesday morning on a major New York-area highway, hitting a wooded median and scattering wreckage across the road. All five people aboard (including two investment bankers) were killed, but no one on the ground was injured. The New York investment banking firm Greenhill & Co. said two of its managing directors, Jeffrey Buckalew (45) and Rakesh Chawla (36) as well as Buckalew’s wife and two children, were on the plane, which crashed on Interstate 287. Buckalew was the registered owner of the single-engine plane and had a pilot’s license. Five people are dead after a small plane crashed on New Jersey’s I-287 Tuesday morning. 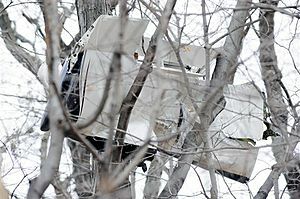 The pilot discussed icy conditions with controllers shortly before the fatal crash. The plane, a high-performance Socata TBM-700 turboprop, came down about 14 minutes after takeoff on I-287 near Morristown, N.J., shortly after 10 a.m. EST. The plane was headed from New Jersey’s Teterboro Airport to DeKalb Peachtree Airport near Atlanta with three adults, two children and a dog on board. According to the Associated Press – the pilot engaged in a seven-second call with a controller about icing prior to the accident. Though, National Transportation Safety Board investigator Robert Gretz told the Associated Press he was unsure if the pilot was reporting that icing had occurred or was questioning the location of possible icing conditions. The ground temperature at the Morristown Municipal Airport was 43 degrees at 10 a.m. However, weather observations taken from nearby Long Island at 7 a.m. indicate that temperatures were subfreezing throughout the atmosphere down to 4,000 feet above the ground. The plane had climbed as high as 17.500 feet. The base of the clouds above Morristown at 10 a.m. was 20.000 feet, but had lowered to 11.000 feet by 11 a.m. Even if no rain or snow is present, moisture within clouds could lead to a layer of ice forming on a plane’s surface if temperatures are below freezing. A small plane headed from New Jersey to suburban Atlanta crashed onto an interstate shortly after takeoff Tuesday, killing five people, authorities said. Two men, one woman, two children and a dog aboard the plane died in the crash in Morristown, New Jersey, just after 10 a.m. ET, said Robert Gretz, a senior air safety investigator with the National Transportation Safety Board. The plane, a six-seater Socata TBM700, was headed from Teterboro, New Jersey, to DeKalb-Peachtree Airport in suburban Atlanta when it crashed onto Interstate 287 about 14 minutes into the flight – Gretz said. The plane was at about 17,500 feet when “there was some discussion between the pilot and the controller of locations of icing conditions,” he said. Gretz said he did not know whether the conversation concerned a cloud that might contain ice; actual icing on the airplane; or whether the pilot was inquiring where ice might be or reporting it. “I’ve heard this thirdhand. … That’s something I need to listen to the tapes to know” – he said. Gretz said he was not aware of any icing conditions on the ground at Teterboro that would have required the plane to be deiced. However, he stressed that the investigation is in its infancy and it is too soon to speculate what might have caused the crash. “It’s too early to tell whether it was something mechanical or something the pilot did – we just don’t know” – he said. Preliminary information is that the five were headed to Atlanta for a combination business-leisure trip – Gretz said. Authorities did not release the names of those who died, pending positive identification by the medical examiner and notification of relatives. But New York investment banking firm Greenhill & Co. reported that those on board were two of the firm’s managing directors, Jeffrey Buckalew, 45, and Rakesh Chawla, 36; Buckalew’s wife, Corinne, and their two children, Jackson and Meriwether. Ages for the children were not given. This entry was posted on Wednesday, December 21st, 2011 at 3:55 am	and is filed under Tragedy. You can follow any responses to this entry through the RSS 2.0 feed. Both comments and pings are currently closed.